Owners and high-ups of more than two dozen media houses, both mainstream and regional, are ready to “peddle Hindutva in the garb of spiritualism” and allow Bharatiya Janata Party (BJP) to “harvest electoral dividends” in the coming elections. 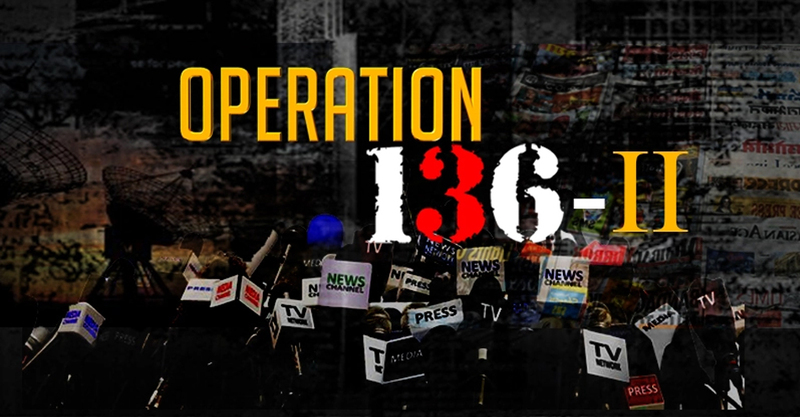 Released on Friday, Part II of the investigative story by Cobrapost titled ‘Operation 136’ exposes various media houses and their ill practices which are reportedly designed to polarise the electorate favoring one ideology over the other. As per the investigation, the media houses agreeing to run the campaign are Times of India, India Today, Hindustan Times, Zee News, Network 18, Star India, ABP News, Dainik Jagaran, Radio One, Red FM, Lokmat, ABN Andhra Jyothy, TV5, Dinamalar, Big FM, K News, India Voice, The New Indian Express, MVTV and Open Magazine. Cobrapost, however, in a press release have said that any material relating to Dainik Bhaskar publications group will not be released at this stage, in compliance with a Delhi High Court order dated May 24, 2018. Dainik Bhaskar group, on Thursday has obtained an ex-parte stay order from the Delhi High Court restricting the web portal Cobrapost from airing second part of the ‘Operation 136’, which according to them would cause “irreparable loss and injury” to the newspaper. As part of the investigation, Cobrapost’s reporter, Pushp Sharma, assumed the identity of a representative of a fictitious religious organisation, Shrimad Bhagwad Gita Prachar Samiti, on a “secret mission”, supposedly with a goal to help the BJP in the 2019 Lok Sabha polls. Similar to the set-up in the Part I of the investigation, the Indian media houses, in its most visceral form, were offered a fortune in return of undertaking a campaign that has the potential to not only cause communal disharmony among citizens, but also tilt the electoral outcome in favor of the BJP. While meeting the owners and senior-most personnel of these media houses, Sharma reportedly asked them to run a media campaign on his behalf, while offering them a big fortune in terms of ad spends, ranging from a few crore rupees to 500 crore rupees. In addition to this, Operation 136 has also reported that most of the media houses are either “owned by politicians themselves, particularly the regional ones, or patronised by politicians, and it is natural for them to become their masters’ voice”. The investigation exposes some senior journalists of the Indian media who allegedly were more than willing to propagate the agenda. The investigation claims that the RSS, and as a corollary, Hindutva, has made deep inroads into not only the newsrooms, but also the boardrooms of Indian media houses. The first part of Operation 136 had exposed India TV, Dainik Jagaran, Hindi Khabar, SAB TV, DNA (Daily News and Analysis), Amar Ujala, UNI, 9X Tashan, Samachar Plus, HNN Live 24×7, Punjab Kesari, Swatantra Bharat, ScoopWhoop, Rediff.com, IndiaWatch, Aj and Sadhna Prime News. In times when there is a public representational crisis in the journalism and only few reporters choose to challenge and question the authority, no wonder India has further dropped from rank 136 to rank 138 in the 2018 World Press Freedom Index!